Since Miss Macchiato already stole all the good recipes from this issue I settled on this one, which I was pretty excited about. Smoked salmon, gorgonzola, capers and dill, what’s not to love? Here is the recipe all typed out in long-hand because they aren’t on their website meh! Drain the pasta, then add it back to the cooking pot, combining with the sauce and reserved 1/2 cup water. 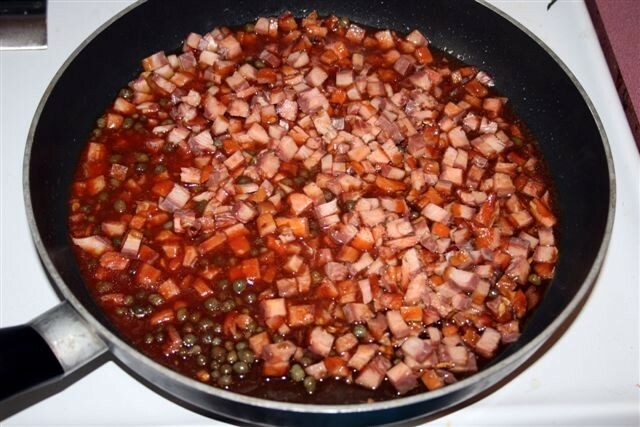 Cook gently on medium 3 to 4 minutes or until water is absorbed and sauce is creamy. Remove, add lemon zest, dill and salt and pepper to taste. To make sauce, heat olive oil in a large skillet on medium-high. Add garlic and cook for 2 minutes. 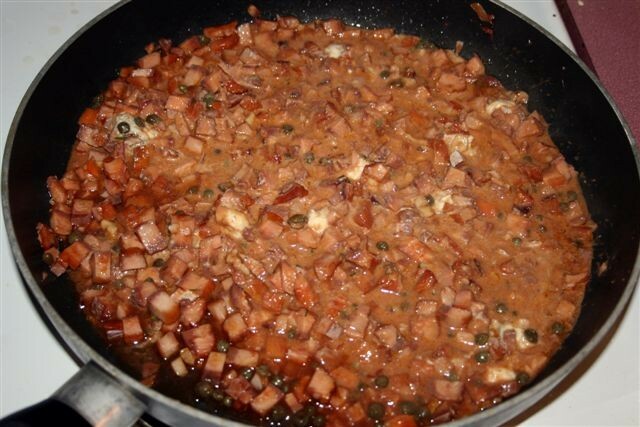 Add salmon, brandy, capers and tomato sauce and cook for 3 minutes. 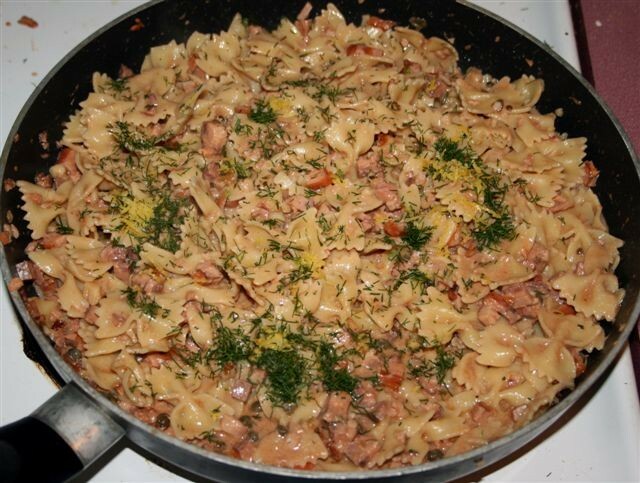 Stir in cheese and walnuts and cook for 1 minute. Remove from heat. Cook pasta according to package directions until al dente. Remove 1/2 cup water from pasta when done and set aside. You’ll notice those are real smoked salmon pieces there, not that lousy pink stuff! You’ll also notice there is a bottle of port there and no brandy. I personally hate buying booze for recipes, and since I rarely drink I decided to use port instead. Which I think was a fine substitution since port is a fortified wine and has brandy in it. Or maybe I’m making that part up. I just like port. Could have stopped right there and just sat down with a fork, but that is probably because the salmon at this point looks like ham. Which would have probably made it turn out better, but I’m getting ahead of myself. Next I put in the walnuts and the lovely lovely cheese. Got to be a winner, right? I mean just look at that! Well no. There was something wrong in this dish, something horribly wrong. Well ok maybe not horribly wrong because we ate all of it. But there was something in this dish that really clashed with the rich earthiness of the gorgonzola sauce. That’s right, it was the dill. 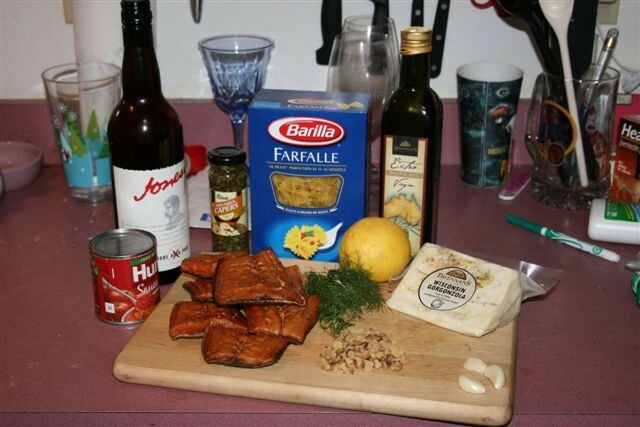 Maybe it would have worked better if I had used a “lesser” smoked salmon (perish the thought!) but as it was the dill just smashed it’s way all over everything WHICH IS WHY WE CAN’T HAVE NICE THINGS DILL!! I’m not opposed to a last-minute change of dinner plans, due to being swept up and away by an exciting new recipe. What can I say, I like the adventure. That’s why I put the epicurious.com “Recipe of the Day” in my reader. Every day, a new contender for my kitchen appears. While some of them can seem a little too outlandish for a weeknight dinner, once in a while, a gem arises. Yesterday’s recipe did that to me, and I rushed out to the store to pick up the ingredients. We’re nearing the end of the summer – it’s far too warm and I’m feeling far too lazy to cook up an elaborate meal that sticks to your ribs. If you have tomato plants and you’re looking for something to do with them, this is it. The term “salsa cruda” is claimed by both Mexican and Italian cooking and means, to both cuisines, “uncooked sauce.” Beyond that, they couldn’t be more different. For Mexican cuisine, it is pico de gallo. In Italian cuisine, it is uncooked sauce that is served over pasta. The only part of the dish that is actually cooked is the pasta itself. Stir together all ingredients except pasta and ricotta in a large bowl with 3/4 teaspoon salt and 1/2 teaspoon pepper. Let stand, stirring occasionally, 20 minutes. Back in the spring, Citizen Chef and I were both debating whether or not to buy some tomato plants. I didn’t, but the whole time I was making the salsa cruda, I wish I had. You’re looking at Tomatoes on the Vine in the bowl, and they were delicious, don’t get me wrong – but fresh tomatoes would have made this out of sight. If you’re growing tomatoes, pick a few and get chopping. Now, you may think that this sounds like a boring topping, but let me assure you while the flavors of the garlic, basil, shallots, etc. are mingling together for 20-some minutes, something very special is happening. Even after 10 minutes you can stick your fork in there and get a taste of what’s going on – the flavors are melding together in a fresh array. It’s divine. Meanwhile, cook orecchiette in a pasta pot of boiling salted water (3 tablespoons salt for 6 qt water) until al dente. Alton Brown sometimes refers to the little pastas that are shaped like an ear – the orecchiette is it. “Orecchio” literally means “ear” in Italian. They do look a little like ears, don’t they? I had a hard time finding orecchiette. I guess I thought it odd because I hear it mentioned so much on food shows, so I assumed it was a little more common. If you needed, you could use pasta shells, but they are hardly the same consistency as the orecchiette. The orecchiette are thicker, and don’t have that ultra sleek and smooth processed consistency that a pasta shell has. Still, if you can find it, great, if not, use whatever you can get. Drain pasta and toss with tomato salsa. Season with salt and pepper and dollop with ricotta. Serve with a small loaf of bread and a side of garlic butter. Bon Appetito! Recently I had a shindig to attend, and I wanted to bring a little something to share. I opted for something out of this month’s magazine selection, Tastes of Italia. It was met with overall acceptance: Those who love the pungent flavor of Gorgonzola loved it, while those who weren’t sure what they were getting into were a bit conflicted. I was surprised at how many people had never eaten Gorgonzola cheese before. In case you happen to be one of them, let’s get nerdy with some Gorgonzola cheese facts from Wikipedia. Gorgonzola is a veined Italian blue cheese, made from unskimmed cow’s milk. It can be buttery or firm, crumbly and quite salty, with a ‘bite’ from its blue veining. It has been made since the early Middle Ages, but only became marbled with greenish-blue mold in the eleventh century. It is frequently used in Italian cooking. The name comes from Gorgonzola, a small town near Milan, Italy, where the cheese was reportedly first made in 879; however, this claim of geographical origin is disputed by other towns. If you live in a town that avidly disputes the origin of a cheese, you’re hard up for a good time. Anyway, it’s like a creamy blue cheese except a bit more pungent in your mouth. If you enjoy that sort of a tart flavor, you’re in for a treat with Gorgonzola. If you aren’t a big fan, then this probably isn’t for you – grab another cheese that is good with walnuts and sundried tomatoes and use that instead. First, we have to start out with the dough. You didn’t think we were going to buy that in a grocery store did you? That’s good. This is one of the easier pizza doughs I’ve ever had to make, not to mention it’s also the quickest and most forgiving dough I’ve made. In a large bowl, combine yeast, sugar and 1/2 cup of water. Stir with a fork until mixed. Cover with a dry towel and let sit for 30 minutes. If the yeast is foamy (like the picture above) continue; if not, throw out the mixture and start over. Add the salt, olive oil and remaining water. Stir in flour 1/2 cup at a time. Dust your hands with flour and knead the dough 5 – 7 minutes or until dough is no longer sticky. This is where I started to have problems. Earlier I said this is the most “forgiving” dough I’ve made – let me explain. While I was putting this together, I was doing other stuff at the same time. So I thought I had counted my 1/2 cups, but even though I swear I put 3 cups in, the dough was still extremely sticky – so much that kneading it wasn’t going to help. I don’t know how much more flour I added, but it had to be like another cup or cup and a half. When it was somewhat less tacky, I then stuck even more flour on the board, floured up my hands and started to knead. It never became non-sticky as the instructions say, so when I could at least handle it without half of it being stuck to my hands in a goopy mess, I called it good and moved on to the next step. Regardless of this, the dough still came out amazing, so I’m not really sure what happened there. Form the dough into a ball and coat it with olive oil. Place the dough in a bowl, cover with a towel and set it in a warm place. Let the dough rise for 1 hour or longer. After the dough rises, dust your hands with flour and re-knead the dough for about 2 minutes. Divide the dough into 4 equal parts and, using your hands, shape each into a flat disk. Cover and let rise for another 30 minutes. Using flour-covered hands, flatten disk further by pressing outward until you reach your desired thickness and circumference. At this point, the dough will be really pliable and somewhat delicate. When you start to roll it out, it will firm up and become more difficult to shape. I had a hard time getting this to go into the shape I wanted. After my first attempt it was too hard to reshape, so I stuck it back into the bowl and let it rise again. After it had another 30 minutes to rise, it was back to the delicateness it was when I took it out of the bowl the first time. Unfortunately, even after my second attempt, I was unable to shape it into a circle, so I made it oblong… sort of. So with my awesome oblong-inspired pizza crust completed, I moved on to the actual pizza. Preheat oven to 500-degrees F. Place pizza crust on baking sheet lightly covered in cornmeal or covered in parchment paper. Brush olive oil over pizza crust. Add salt, then cheese, walnuts and tomatoes. Add pepper and parsley and bake for 7 – 8 minutes. Remove and serve. Because my pizza was an odd shape, I disguised it by cutting it into rectangles. The weird corners were eaten by me. I liked this a lot, as did other Gorgonzola lovers. It was gone by the end of the night. Scroll back to the top if you wanted to see the finished product on the cover of the Tastes of Italia magazine. As promised, we are going to kick off this month’s Magazine of the Month, the August ’08 edition of Tastes of Italia, with Chocolate Almond Gelato. Oh, no. And I wouldn’t say that out loud either because among certain circles you’re bound to stir up trouble. Gelato connoisseurs feel just as strongly about the dessert as New Yorkers feel about the Yankees: It’s a religion unto itself. Gelato and some premium ice creams are so dense that they require a slightly higher serving temperature, a perfect point where your scoop is firm but not hard and not so soft that it melts immediately. Gelato recipes usually include more egg yolks, more milk and less cream. It actually has less fat than regular ice cream, but gelato’s low overrun makes for an extremely dense, rich and creamy treat. Anyway, so there you have it. Gelato, the lesser fat, creamier and tastier version of ice cream. You know, for a website that’s all about ice cream, they sound pretty sold on gelato being superior. Maybe they should change their name to World of Gelato. I started off toasting the almonds. Years ago I would have been way too lazy to do this, and then in the end I would have been terribly disappointed: Toasted almonds change in texture to a version that is softer in nature, even after they are refrozen in the final product. When you bite down on the toasted version, I don’t get a sense of “crunch” so much as I do a “pop” and then a spongy feel that goes really well with the gelato. An untoasted crunch would be way too distracting and unsettling – as if there was something in your gelato that should not be. Place milk, eggs, chocolate, sugar and 1/4 cup of toasted almonds in a saucepan and whisk until the sugar and chocolate dissolves. Simmer until mixture thickens and begins to boil. You will note in the picture below we aren’t getting a full boil as you would with water. It’s more like the molten effect of a chocolaty hot tub. Once it boils, remove from the burner and add vanilla. Place in refrigerator for 2 hours or until completely cold. If the mixture thickens too much in the refrigerator, thin with a little milk to get a looser consistency before pouring this into the ice cream machine. Place in a frozen dessert machine and make according to instructions. Top with remaining almonds. Unfortunately I don’t have any personal finished product pictures, as I couldn’t stop eating it while it was churning around in the ice cream maker. To wrap up AwK’s BBQ month, I was going to share another submission from the Build A Better Burger Book. The final was a winner of a creative award and looked really interesting. So, the burger was made. I had photos. I had materials. I was ready. Then I got busy and forgot from fighting terrorism, blowing up small villages and getting to da choppa with Arnold Swartzenegger. The AwK BBQ month has officially ended, but I’m still going to share this quirky little burger. As I already said, this burger is the winner of the creativity award in 1996. Most of the creativity award burgers are just that – very creative. When you take your first bite, it’s hard to know what to expect, so keep an open mind. I was looking for something very different when I made it, so I was prepared. I want to give you a glowing review, but because it’s the creativity award burger, you know it was a little weird. If you walked into an authentic Indian restaurant and asked them to make you a hamburger, this is exactly what it would taste like. Since I enjoy Indian food, I did like the taste – it was just odd having it as a hamburger. To make the burgers, just take the ingredients and mix them together. Handle the meat as little as possible to avoid compacting it. Grill, turning once until done to preference – 4 minutes on each side for medium-rare. The burger is to be accompanied by a banana-yogurt sauce called “raita.” Before you get weirded out, just keep in mind that Indian food usually contains a lot of sweet flavors and is usually yogurt or tomato sauce based. The raita, while sounding odd on top of a hamburger, makes sense from an Indian cuisine standpoint. After reading through the ingredient list, you see right away this is going to be very sweet. Most people associate Indian food with 5-alarm spicy, but that isn’t always the case. A lot of their food has a lot of sweet, fresh flavors to balance that out, similarly to what you’re seeing with the raita. To make the raita, brush the grill rack with vegetable oil. Place the bananas on the grill and cook, turning carefully, until lightly browned all over. The book says it should take 1 – 2 minutes, but on a skillet, it took a little longer. At first I was worried the banana would turn to mush over the fire, but the inside stayed firm. As soon as it turned a little brown, I flipped it over. Any longer than that and it would have been destroyed – so keep watching it while you’re cooking it. While the bananas are cooking, place 1 teaspoon garam masala and the cumin in a fireproof container and toast on the grill for about 1 minute. Since I was using the Foreman, I didn’t do this part. Dice up the banana into small cubes and mix with the rest of the raita ingredients. Stir well and set aside until the burgers are finished cooking. To assemble: On each bun bottom, place 4 cucumber slices, a tomato slice, a patty and an equal portion of the raita. Add the bun tops and serve. Here’s a shot of my finished burger as I was serving. This concludes the Build A Better Burger series. If you liked what you saw, go pick up a copy! August is here and we’re kicking off another Magazine of the Month adventure with Tastes of Italia! And yes, that thing of beauty on the cover is Pizza with Gorzonzola, Sundried Tomatoes and Walnuts and we will be making it! Our previous magazines all had websites where their recipes were published, however ToI does not, so be sure to run out to your local grocery store or bookstore and pick up a copy. The reason we went for this magazine is because there are a ton of amazing and diverse Italian recipes in here, and because Citizen Chef is a slacker and didn’t propose any magazines to review. So this month it’s my choice! We’ll be reviewing a variety of recipes including this Chocolate Almond Gelato you see above, and we’ll also be exploring risotto! For you vegetarians out there, you’re in luck as this mag usually has a lot of delicious and fun dishes that will suit you. Run out and pick up a copy this weekend!